It can be tremendously overwhelming trying to pinpoint an allergy in your pet. You may notice constant itching, red skin, bouts of nausea and diarrhea, reoccurring ear, eye or skin infections or lack of appetite. Any one of these symptoms could be pointing to an allergy in your pet. Allergies can be both seasonal and food-related. Unfortunately, symptoms aren’t mutually exclusive, which makes it hard to tell what your pet is battling. Both outdoor and food-related allergies can display in the same manner. Seasonal, outdoor allergies can cause red, itchy skin and eyes, hives and ear, eye and skin infections. Food-related allergies can absolutely cause all those same symptoms, but fall heavily onto digestive troubles when a food intolerance is present. These symptoms can include vomiting, diarrhea, lack of appetite and digestive irregularity. Symptoms are not limited to this, and can present in a different manner from pet to pet. Because of the vast array of triggers, it’s best to start out by process of elimination. Since you can’t eliminate daily walks outside, start with food. Grains, wheat, corn and soy are the most common triggers. Commonly fed protein sources like chicken can also be an allergy trigger as well. Switch to a grain-free formula with a unique protein like duck, rabbit or venison. 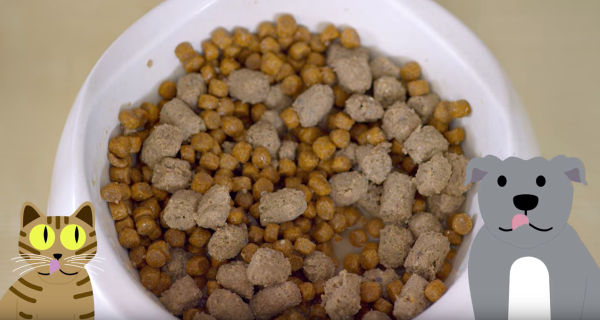 Many believe that it’s not appropriate to switch your pet’s food, but we’re here to assure you that Rotation Feeding (switching out what protein you feed a few times a year) can help reduce the risk of food allergies. 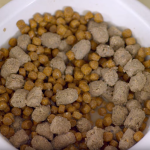 Food allergies can occur in dogs and cats when they eat the same thing for a number of years and don’t experience a variety of different foods. When transitioning your pet to his/her new food to curb their allergies, always make sure to eliminate human-food handouts during this period of time. If you switch to a chicken-free, grain-free formula, but still let your pup chow down on your Chicken Alfredo Pasta leftovers (which we never recommend), your efforts won’t amount to much. We should also mention that if your dog is already grain, wheat, soy and chicken free, simply try to change their protein. If they’re not doing well on poultry, try fish. If beef isn’t working, try venison or lamb. If you’ve tried all of the above, we encourage switching to a limited ingredient, potato and gluten free option. Ingested grains and potatoes that the body doesn’t use as fuel, all break down into sugar that feeds yeast. 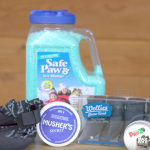 This ultimately accelerates your pet’s itchy skin, hot spots, ear, paw and eye infections. While making the transition to your pet’s new food, supplement with pure pumpkin to ease any digestive upset that can occur. Pure pumpkin is high in fiber, low in fat and rich in beta-carotene, magnesium, potassium, iron, zinc and vitamins A and C. A few tablespoons (dependent on your dog’s size) with each meal will help regulate bowel movements and stabilize the digestive system while your pet transitions to their new food. Give your pet a solid two weeks on the new food to determine any digestive or skin changes. Changing to a grain-free formula should clear your allergy-ridden pet from yeast buildup, digestive irregularity, lack of energy and skin troubles. Over the course of a couple of weeks, their symptoms should improve. While changing your pet’s diet will help build up their immune system and strengthen their gastrointestinal tract, it can’t protect them from seasonal, outdoor allergies. This is where a probiotic comes into play. When us humans visit the doctor with digestive upset or a weak immune system, doctors recommend a probiotic — the same rules apply to our pets! Probiotics are designed to strengthen the immune system, control yeast and candida, improve digestion and reduce inflammation of the skin. They contain healthy bacteria that can survive within the stomach and intestines to correct imbalances. Probiotics also feed healthy bacteria growth and regulate bowel movements and enzymes that reduce inflammation. The combination of a high-quality, grain-free food and a probiotic should be the answer to most of your pet’s allergy symptoms. It’s important to continue this trend from puppy/kitten into adulthood to ensure your pet achieves the best, most comfortable life possible.